This book comprehensively examines the entire legal process of the international sale of goods, beginning with the creation of the contract and continuing through to either the fulfilment of the sale, or the termination of the contract. Every day goods are globally traded between sellers and buyers in different countries and different jurisdictions. The distances between the parties involved in such transactions, and the relative risks related to that, are a key issue in international commercial sales. Sales of goods carried by sea, thus, differ quite drastically from domestic sales; the goods will be normally shipped at a port very distant from the buyer, preventing his physical presence at the port of loading. Further, the goods will travel in the custody of a carrier, a party normally quite independent from either trader. Finally, transactions concluded on shipment terms are normally irreversible, in the sense that shipping the goods back to the seller represents an unlikely option for the buyer. Traders around the world very frequently choose English law to govern their contracts, with disputes to be resolved through London arbitration or litigation. The basis of that law is to be found in the English Sale of Goods Act 1979, and the book consequently also includes an examination of the fundamental principles of that Act, as well as considering use of the Vienna Convention on the International Sale of Goods. 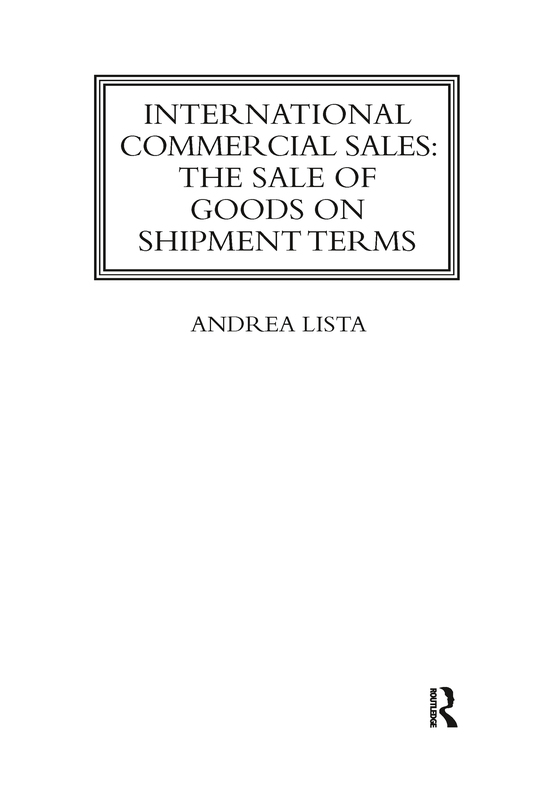 This book will be an invaluable reference point for legal practitioners specialising in the sale of goods, as well as postgraduate students and academic researchers working in sales of goods and the international trade sector.